This morning I dropped DH and Dd off at the magic kingdom and was off to pick up a friend to do a couple of escape rooms. 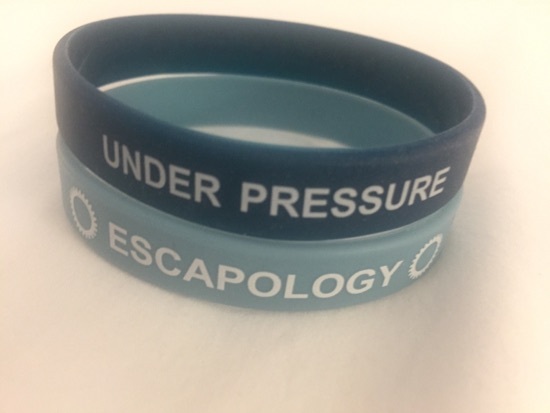 I left DH and DD at 10.30am and made my way to collect my friend from her hotel just along from ours: we arrived at escapology around 11.30 and our first booking was at 12pm. We were asked to sign a waiver, something we've never had to do at one in the U.K.  Anyone who isn't familiar with escape rooms the concept is you are &lsquo;locked' in a room with 1 hour to solve the puzzles in order to escape. Having done 12 in the U.K. we had high hopes for these ones. Our first room was under pressure, the theme was being trapped on a navy submarine in the Atlantic running out of oxygen. This room was absolutely brilliant, some really great puzzles, we thoroughly enjoyed it and managed to escape with 9 minutes to spare. We then had a short wait for our next room, this one was called antidote. The there was a vial containing a disease has been broken in a lab and you have an hour to find the antidote and get out before all biological matter in the lab is destroyed. We didn't enjoy this one quite as much, they had told us this was their easiest room (under pressure was their hardest), we felt there wasn't as many puzzles in this room which is probably why it's easier: we managed to escape with just under 20 minutes to go. The games masters were fantastic and so friendly. The really nice touch was that you got a wristband if you escaped the room which make great souvenirs! We left escapology around 3 and I dropped my friend back off at her hotel and I drove to magic kingdom and parked up, I had arranged to meet DH and Dd at the tambu lounge about 5pm for some dinner. I arrived abit early but managed to grab a table for us a few minutes later. I sat and looked at the menu whilst waiting for them to arrive. We each ordered a drink, as I was/had been driving DH ordered a tropical McCaw cocktail, this is coconut rum, melon liqueur, pineapple juice and cranberry juice. DH really enjoyed this. 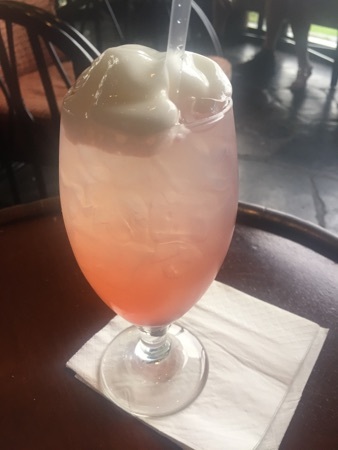 I had a watermelon lemonade, this was topped with lemon lime foam. 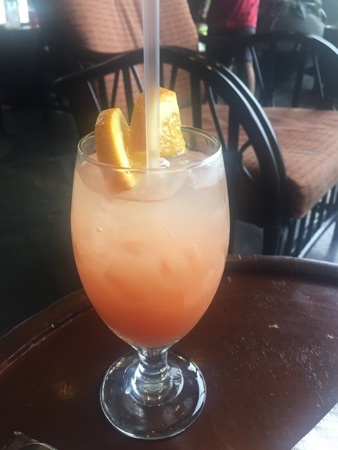 This was sooooo good, really refreshing! Dd had a grapefruit spritzer, this was grapefruit and lime topped with soda water, this was really quite tart to drink. I definitely preferred my drink but we kind of shared both each. 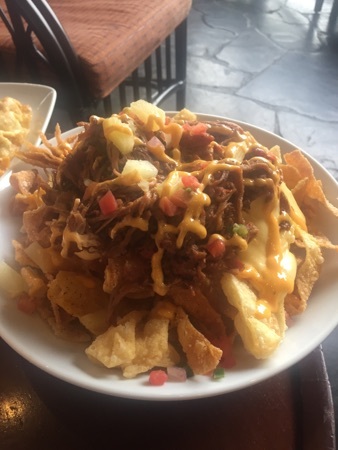 We also got the pulled pork nachos, these were Polynesian chips topped with pulled pork, cheese, pineapple salsa and spicy mayonnaise. These were really delicious, the portion was absolutely massive! There were loads of chips and plenty of topping! 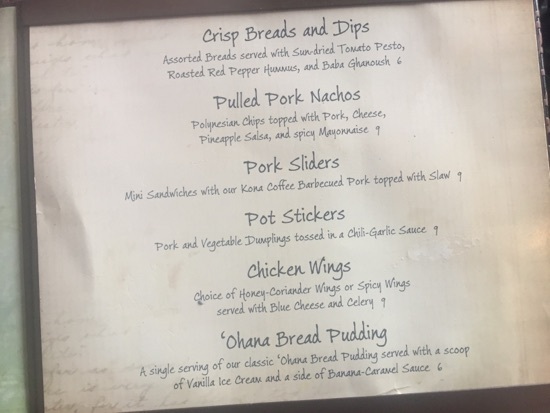 The third and final thing we ordered was the breads and dips, there were 3 different type of bread, a tortilla chip style, the pineapple coconut bread from ohana and another flatbread type. 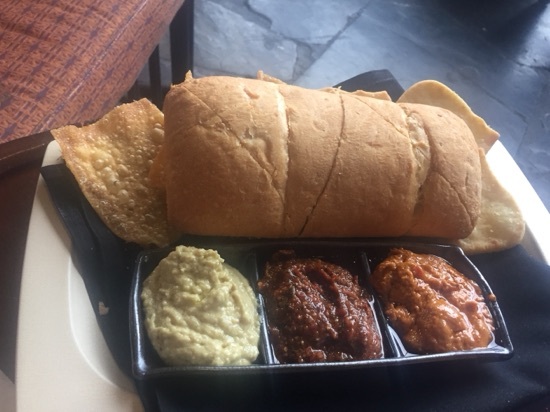 The three dips were tomato pesto, red pepper hummus and baba ghanoush. Dd ate most of the bread, especially the pineapple coconut which she loved. The dips were nice, the tomato pesto was my favourite, I wasn't too keen on the baba ghanoush (I don't even know what that is). We ate as much as we could and had to admit defeat and ask for a to go box for the rest of our nachos. This also meant that unfortunately we were too full (again) for the bread pudding which is my main reason for coming here! When will I learn not to over order to I have room for the dessert! 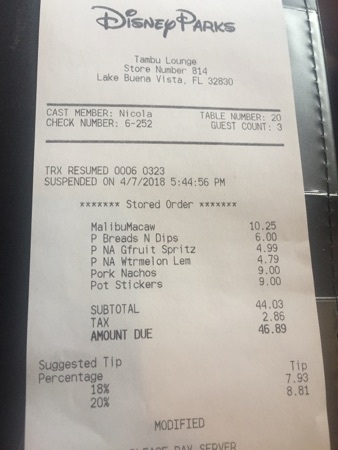 We asked for the bill and the total came to $46.89 and we payed up and walked back to the car in the magic kingdom carpark. On the way back to the hotel we stopped at the 7-11 over the road for some drinks to take with us to the beach club tomorrow. 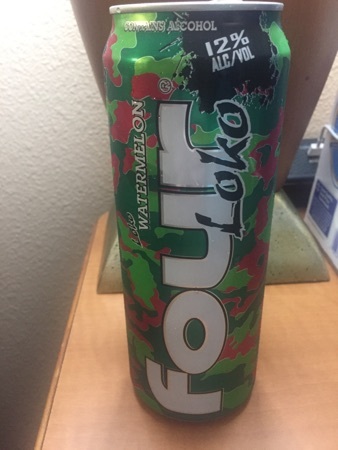 We packed our overnight cases and had a few drinks in the room, I had picked up a watermelon four Loko from 7-11 and thought I'd give it a try, definitely glad I just got the one it doesn't taste great at all - I don't recommend anyone try this! Much prefer the mikes lemonades and &lsquo;rita' cans. We decided on an early night as we wanted to be up bright and early to check in to the beach club in the morning. New Photo Added by missdopey - 8 Apr 18 1:02 AM. The escape rooms sound fun. 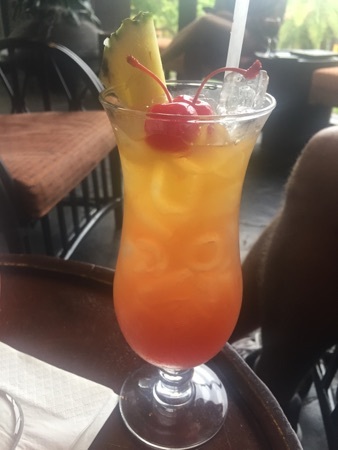 Your snacks and drinks look nice at the Tambu Lounge. 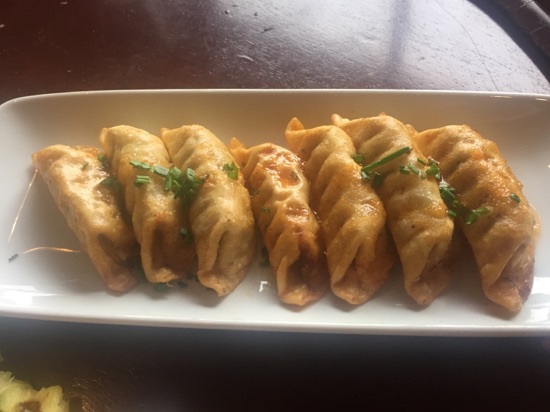 Oh my goodness those pot stickers and nachos look amazing! I got an escape room voucher for a party of 5 for my birthday, you just reminded me of it, need to book it soon as they sound so much fun! PS baba ganoush is a dip made from grilled aubergine - I love it so much! 3 Non Blondes and a Baby go to WDW! 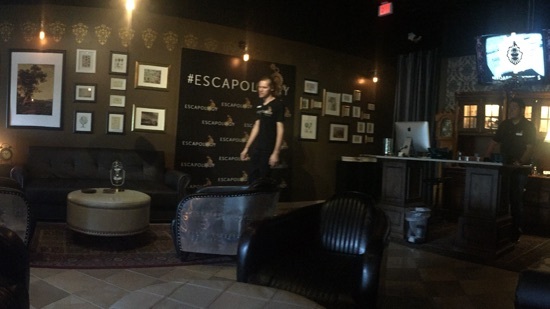 Escapology sounds like fun. And dinner sounds very tasty.